Could gravitational waves reveal how fast our universe is expanding? (Nanowerk News) Since it first exploded into existence 13.8 billion years ago, the universe has been expanding, dragging along with it hundreds of billions of galaxies and stars, much like raisins in a rapidly rising dough. Astronomers have pointed telescopes to certain stars and other cosmic sources to measure their distance from Earth and how fast they are moving away from us -- two parameters that are essential to estimating the Hubble constant, a unit of measurement that describes the rate at which the universe is expanding. But to date, the most precise efforts have landed on very different values of the Hubble constant, offering no definitive resolution to exactly how fast the universe is growing. This information, scientists believe, could shed light on the universe's origins, as well as its fate, and whether the cosmos will expand indefinitely or ultimately collapse. Now scientists from MIT and Harvard University have proposed a more accurate and independent way to measure the Hubble constant, using gravitational waves emitted by a relatively rare system: a black hole-neutron star binary, a hugely energetic pairing of a spiraling black hole and a neutron star. As these objects circle in toward each other, they should produce space-shaking gravitational waves and a flash of light when they ultimately collide. In a paper published in Physical Review Letters ("Measuring the Hubble Constant with Neutron Star Black Hole Mergers"), the researchers report that the flash of light would give scientists an estimate of the system's velocity, or how fast it is moving away from the Earth. The emitted gravitational waves, if detected on Earth, should provide an independent and precise measurement of the system's distance. Even though black hole-neutron star binaries are incredibly rare, the researchers calculate that detecting even a few should yield the most accurate value yet for the Hubble constant and the rate of the expanding universe. "Black hole-neutron star binaries are very complicated systems, which we know very little about," says Salvatore Vitale, assistant professor of physics at MIT and lead author of the paper. "If we detect one, the prize is that they can potentially give a dramatic contribution to our understanding of the universe." Vitale's co-author is Hsin-Yu Chen of Harvard. Two independent measurements of the Hubble constant were made recently, one using NASA's Hubble Space Telescope and another using the European Space Agency's Planck satellite. The Hubble Space Telescope's measurement is based on observations of a type of star known as a Cepheid variable, as well as on observations of supernovae. Both of these objects are considered "standard candles," for their predictable pattern of brightness, which scientists can use to estimate the star's distance and velocity. The other type of estimate is based on observations of the fluctuations in the cosmic microwave background -- the electromagnetic radiation that was left over in the immediate aftermath of the Big Bang, when the universe was still in its infancy. While the observations by both probes are extremely precise, their estimates of the Hubble constant disagree significantly. "That's where LIGO comes into the game," Vitale says. LIGO, or the Laser Interferometry Gravitational-Wave Observatory, detects gravitational waves -- ripples in the Jell-O of space-time, produced by cataclysmic astrophysical phenomena. "Gravitational waves provide a very direct and easy way of measuring the distances of their sources," Vitale says. "What we detect with LIGO is a direct imprint of the distance to the source, without any extra analysis." In 2017, scientists got their first chance at estimating the Hubble constant from a gravitational-wave source, when LIGO and its Italian counterpart Virgo detected a pair of colliding neutron stars for the first time. The collision released a huge amount of gravitational waves, which researchers measured to determine the distance of the system from Earth. The merger also released a flash of light, which astronomers focused on with ground and space telescopes to determine the system's velocity. With both measurements, scientists calculated a new value for the Hubble constant. However, the estimate came with a relatively large uncertainty of 14 percent, much more uncertain than the values calculated using the Hubble Space Telescope and the Planck satellite. Vitale says much of the uncertainty stems from the fact that it can be challenging to interpret a neutron star binary's distance from Earth using the gravitational waves that this particular system gives off. "We measure distance by looking at how 'loud' the gravitational wave is, meaning how clear it is in our data," Vitale says. "If it's very clear, you can see how loud it is, and that gives the distance. But that's only partially true for neutron star binaries." That's because these systems, which create a whirling disc of energy as two neutron stars spiral in toward each other, emit gravitational waves in an uneven fashion. The majority of gravitational waves shoot straight out from the center of the disc, while a much smaller fraction escapes out the edges. If scientists detect a "loud" gravitational wave signal, it could indicate one of two scenarios: the detected waves stemmed from the edge of a system that is very close to Earth, or the waves emanated from the center of a much further system. "With neutron star binaries, it's very hard to distinguish between these two situations," Vitale says. In 2014, before LIGO made the first detection of gravitational waves, Vitale and his colleagues observed that a binary system composed of a black hole and a neutron star could give a more accurate distance measurement, compared with neutron star binaries. The team was investigating how accurately one could measure a black hole's spin, given that the objects are known to spin on their axes, similarly to Earth but much more quickly. The researchers simulated a variety of systems with black holes, including black hole-neutron star binaries and neutron star binaries. As a byproduct of this effort, the team noticed that they were able to more accurately determine the distance of black hole-neutron star binaries, compared to neutron star binaries. Vitale says this is due to the spin of the black hole around the neutron star, which can help scientists better pinpoint from where in the system the gravitational waves are emanating. "Because of this better distance measurement, I thought that black hole-neutron star binaries could be a competitive probe for measuring the Hubble constant," Vitale says. "Since then, a lot has happened with LIGO and the discovery of gravitational waves, and all this was put on the back burner." Vitale recently circled back to his original observation, and in this new paper, he set out to answer a theoretical question: "Is the fact that every black hole-neutron star binary will give me a better distance going to compensate for the fact that potentially, there are far fewer of them in the universe than neutron star binaries?" Vitale says. To answer this question, the team ran simulations to predict the occurrence of both types of binary systems in the universe, as well as the accuracy of their distance measurements. From their calculations, they concluded that, even if neutron binary systems outnumbered black hole-neutron star systems by 50-1, the latter would yield a Hubble constant similar in accuracy to the former. More optimistically, if black hole-neutron star binaries were slightly more common, but still rarer than neutron star binaries, the former would produce a Hubble constant that is four times as accurate. "So far, people have focused on binary neutron stars as a way of measuring the Hubble constant with gravitational waves," Vitale says. "We've shown there is another type of gravitational wave source which so far has not been exploited as much: black holes and neutron stars spiraling together," Vitale says. "LIGO will start taking data again in January 2019, and it will be much more sensitive, meaning we'll be able to see objects farther away. 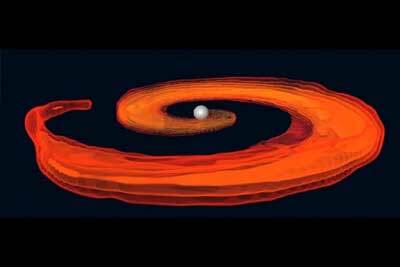 So LIGO should see at least one black hole-neutron star binary, and as many as 25, which will help resolve the existing tension in the measurement of the Hubble constant, hopefully in the next few years."